A: Main baleen features of an extantrorqual, at different scales; tubule diameter~0.5 mm (modified and redrawn fromSzewciw et al., 2010). B: Location of CerroColorado, Peru (detailed map in Fig. DR1 [seefootnote 1]). C: Left baleen rack of the balaenopteroid specimen M1 as found in the field,with drawing showing the original positionin the whale skull. D: Right baleen rack ofspecimen M1.Larger images are available from the lead author. Credit: Anna Gioncada and Geology. In 2008, remains of a giant raptorial sperm whale, Livyatan melvillei, were discovered at this site. In September 2014, the same international team of researchers, guided by Giovanni Bianucci from Pisa University (Italy), found a partial skeleton of a mysticete whale in a rock boulder. Besides fossil bones of the skull and mandibles, the rock containing the skeleton showed perfect casts of the whale baleen. The exceptionality of the finding is that the casts provide details at the submillimetric scale, revealing under the microscope the subtle structure of the baleen bristles. Indeed, fossilized baleen bristles have been studied for the first time by chemical and mineralogical analyses. The data obtained allow researchers to compare the Miocene whale feeding habits to those of the extant sea whale, and strengthen the preservation potential of the Ica desert for the marine vertebrate fossil record. 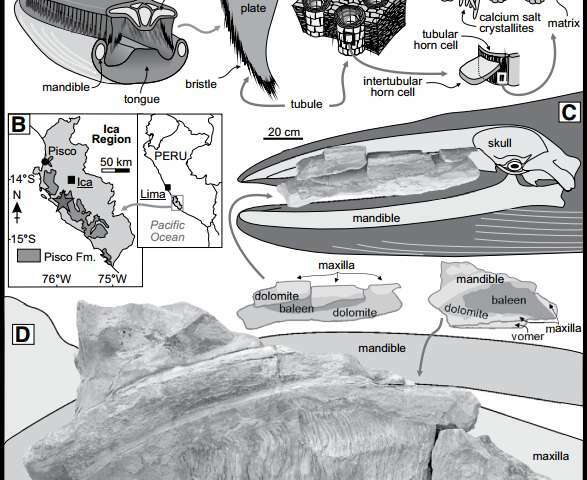 More information: Inside baleen: Exceptional microstructure preservation in a late Miocene whale skeleton from Peru, Anna Gioncada et al., http://geology.gsapubs.org/content/early/2016/08/23/G38216.1.abstract.